be. All of this information is now available to us in this book. 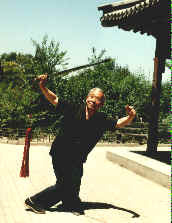 I began to learn about Yin Cheng Gong Fa after I had been studying martial arts for about five years. Little did I know that the picture and the temple were going to play a major part of my life in the future. said with a smile. "Taiji can be used for real fighting and can be very effective," he calmly returned. but what I repeatedly found instead was the floor and I had no memory of how got there. in the United States. I studied with him one year before he decided he wanted to teach more students. China to study with his Kungfu family. the money, the visa and the plane ticket and it was time to leave. Yun's older Kungfu brother, Master Lu opened his home to me and treated me like a nephew. a modern day world. As you might expect, my training was hard and intense, bringing tears at times. Looking back, I wouldn't trade those moments for anything. Wang lives in Beijing's old district, which has the aura of a town still tucked away in the last century. clothing turned the crowded streets into a patchwork of drab blues and grays. 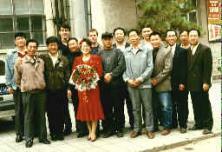 with my Kungfu uncles in Beijing. my Shi Bo Zhao Zeren. carefully placed on the wall above his head. his eyes. I was in total awe of what was taking place. wherever and whenever he wished. could be made a disciple of the Kungfu family. generations before him. It is his duty to learn and preserve the techniques and philosophy of the family. example, becomes one's Kungfu uncle, as Master Lu became for me. good fortune to be accepted as a full member of Yin Cheng Gong Fa. of." 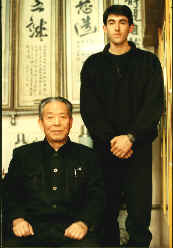 Yin Cheng Gong Fa, then, refers to the method or Kungfu family of the man known as Yin Cheng. 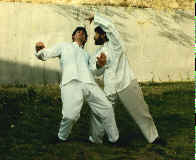 of not only Taiji but also Xingyi, Bagua, Shaolin, Tantui, Tongbei, Baiji, Paotui and many other styles. 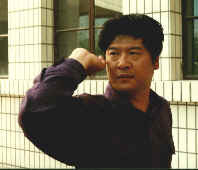 Master Wang, himself, knows fifteen or more styles. into any martial arts practice. This system is not an exclusive system. Nor does it advance any system or style as superior to others. his own experience to devise this new martial arts training system. Fa training, I am delighted that this book is finally available. volumes aimed at preserving a part of classical martial arts history. wield it was regarded as refined and of a high level, attained by only accomplished practitioners. Wang's method. With careful training, one can feel changes and sensations while practicing the form. derive these movements from correct principles and feelings. destination. It took a lot of pleading to talk my poor uncle into allowing us to take this risky trip. Eventually my perseverance succeeded and we boarded a train and headed for the Shaolin Temple. a delay. I had to be back in Beijing to catch my flight home and we were running out of time. to sit beside us and began to explain that he had overheard us discussing our plans to go to Wudang. internal Kungfu and wanted to visit the birthplace of Taiji. bottom was visible. Finally after five hours, we arrived at a small village about halfway up the mountain. in the picture I had hung in my room years before. profound but were no longer a surprise. here in the United States and abroad. 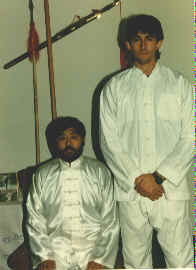 Cheng Gong Fa Association and Beijing Wu Style Taiji Quan Association North American Branch.